Treasure, World & U.S. Coin Auction #25: May 2-3, 2019. Daniel Frank Sedwick, LLC. Register Today! 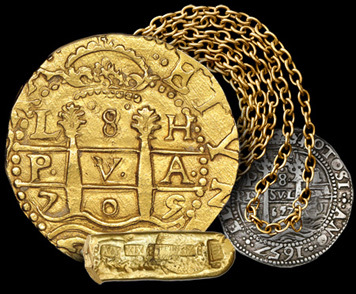 Under Gold Cobs, at the beginning of the auction, you�ll find a nice selection of 1715-Fleet coins, most in very high grade, including selections from the Stuart Auerbach collection. Don�t miss the very rare Atocha and Santa Margarita gold cobs. 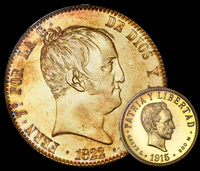 Within the World Gold Coins section, there is an important La Rioja (Argentina) 1832/1 8 escudos NGC MS 62 (lot 80). Go to lot 107 for the finest known Popay�n (Colombia) 1879 10 pesos PCGS AU 58. And don�t miss the Tegucigalpa (Honduras) 1883 10 pesos NGC AU 50, considered among the rarest gold issues of Latin America, in addition to several examples of rare colonial Guatemalan gold coins. As mentioned above, our Shipwreck Ingots section offers a profusion of gold and silver bars, particularly from the �Tumbaga wreck� (lots 194 and 202-206). We also have gold bars and cut pieces from the Atocha, Santa Margarita, and 1715 Fleet as well as silver bars from the Atocha and other wrecks, not to mention a huge natural gold specimen from California (lot 201). Within our Shipwreck Coins section, where you will find many of the usual shipwrecks represented, we have an unusually large selection of Concepci�n coins and an assortment of interesting clumps. A standout in this section is a coin from the pirate ship Whydah, a Potos� (Bolivia) cob 8 reales of 1709 (lot 442). Finally, for U.S. shipwreck collectors, please note lots 510-515 where you will find several U.S. gold $20 coronet Liberty �double eagles,� 1857-S, from the S.S. Central America. Looking for coin jewelry? Our popular dedicated Coin Jewelry section has expanded, with a large and pleasing selection of gold and silver coins, particularly from shipwrecks, including ancient coins (which look especially nice mounted in jewelry). We also have a selection of attractive ancient coins in the immediately-following Ancients section. Mexico Silver Cobs features a very important Charles-Joanna �Early Series� assayer-F 4 reales NGC AU 53 (lot 655). Within the Lima Silver Cobs, we highlight some Philip II assayer-Rinc�n pieces (lots 715-719) and two Royals/galanos (lots 736 and 738). There are also nine Royals/galanos within the Potos� Silver Cobs section, a healthy selection for those who collect them. Our large World Silver Coins section has become a showcase for Latin American coins, and this auction is no exception. Note lot 969, a Bogot� (Colombia) pillar 1 real, Charles III, 1760JV, which is one of only six different Colombian pillar issues confirmed to exist. We are offering a large selection of coins from Honduras, spanning 1824 to 1910 (lots 1073-1116); particularly important are the Tegucigalpa provisional issues. The Mexico section features a terrific offering of pillar 2 reales from the Potomac Collection. Outside of Latin American be sure to check out the fabulous 1945 roof set from Lahore, British India (lots 1132-1136). Last but not least, don�t miss the Skyler Liechty Collection of French Caribbean Coppers and Countermarks (lots 1303-1317). Within Medals and Decorations is a fine selection of Admiral Vernon medals (lots 1330-1342), most of which are pedigreed to the John Adams collection and some of which are outstanding examples. Colonial collectors will also admire the 1687 British medal (lot 1329) struck to commemorate the salvage of the Concepci�n by Sir William Phips. Also be sure to note the 1812 silver medal from Argentina (lot 1318) commemorating the Battle of Tucum�n, the first example we have seen. Under Peru (lot 1355), you�ll see a very impressive diamond-and-gold medal commemorating the national codifiers of the laws of the country, no doubt very expensive to produce in its time and a true jewel of Peruvian political history. Our last four regular sessions are no less exciting. First, under U.S. Coins and Paper Money we have an assortment of choice Morgan dollars as well as two unique Puerto Rico pesos engraved by Spanish-American War soldiers (lots 1388 and 1389). Also there is a 1771 Pennsylvania colonial 20-shillings note signed by an original signer of the Declaration of Independence (lot 1397). In World Paper Money we have an important selection of rare notes from Colombia and Costa Rica; also be sure to notice the 1884 Uruguayan pattern proofs (lot 1477). Under Documents, you�ll see a large grouping of Theodore de Bry engravings, all hand-colored, and most depicting some real or fanciful scenes from early contact between the Spanish and natives (lots 1479-1489), as well as a sizable selection of colonial-era maps. Finally, the Artifacts section is where we keep some real gems. Lot 1525, four Atocha gold money chain links, is one such prize, as is the next lot, a rare silver candlestick holder. The main event is lot 1535, a 1715-Fleet gold chain that is a whopping 43 inches long. Following that is a much shorter �olive blossom� chain, which could easily be made into wearable jewelry. As usual we also have a large selection of non-wreck items like cannonballs, guns, swords, and other armor and oddities. An Express session at the end offers budget-level items from all the regular sections. To all our bidders we wish the best of luck and extend our thanks for your continued support. Enjoy! 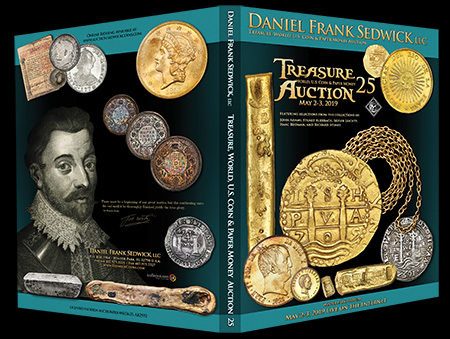 NOTE: While you may browse the lots on other platforms like Sixbid or Numisbids, online bidding must be done at www.auction.sedwickcoins.com, where you can browse the lots and bid on the fly or bookmark lots to bid on later.